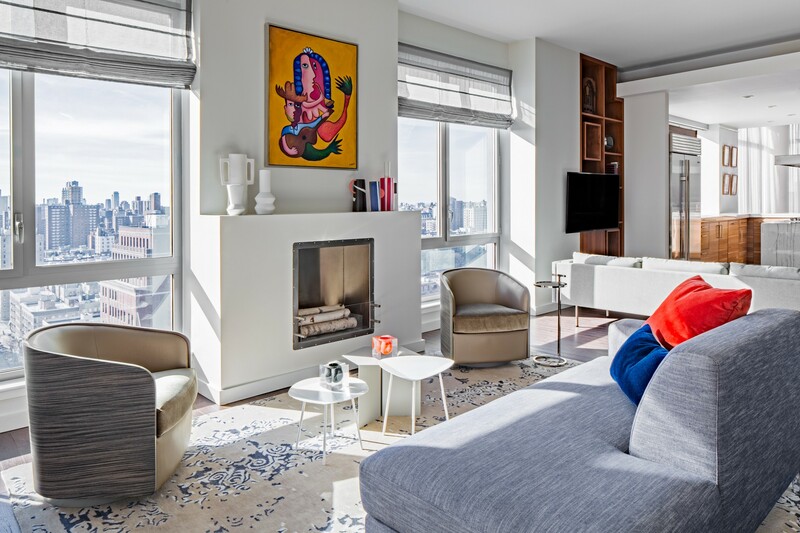 When a bachelor financier purchased an expansive loft overlooking Union Square, he reached out to Decor Aid, and asked for our help in designing his new home. From the outset, we were tasked with creating a chic, rustic bachelor pad, which could also be used for occasional entertaining. The loft’s most appealing features were also the space’s biggest design challenges. 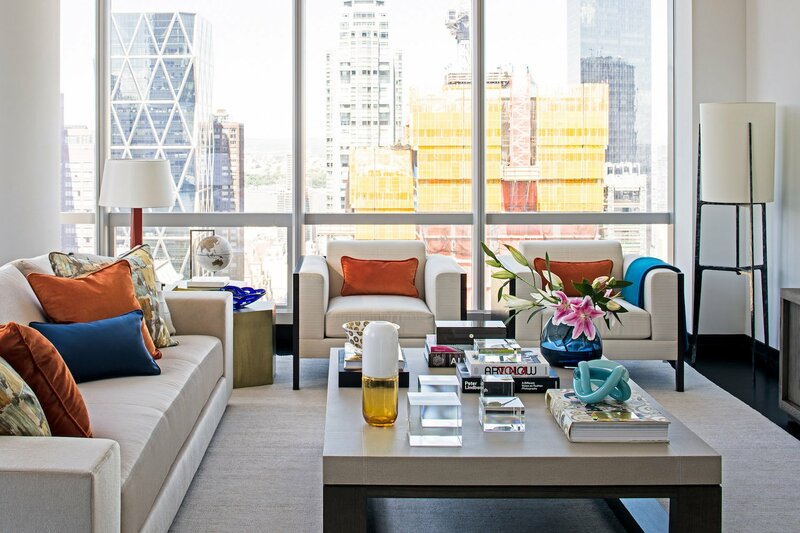 With no walls and a completely open floor plan, we had to establish four seperate areas—work, sleep, eat, and play—without disrupting the views offered by the apartment’s floor-to-ceiling windows. At first, our client wanted to refinish the loft’s 19th century hardwood floors, as a few patches had picked up wear and tear over the past 150 years. But we advised against this; refinishing the floors would have been expensive, and the majority of the wood was in beautiful condition. Instead, we advocated for a design scheme that would disguise the damaged sections of the floor, while highlighting the pieces of wood in top-notch condition. The first step in the redesign was to repaint the loft. Instead of going for the usual all-white design scheme, we gave the walls a grayish cream color, and adorned the windows with a white trim. We placed a bookshelf perpendicular to the largest section of wall, which demarcated the bedroom from the rest of the space. We sourced a collection of rustic-modern furniture pieces, including a reclaimed wood desk from Four Hands, to reference the apartment’s existing elements. 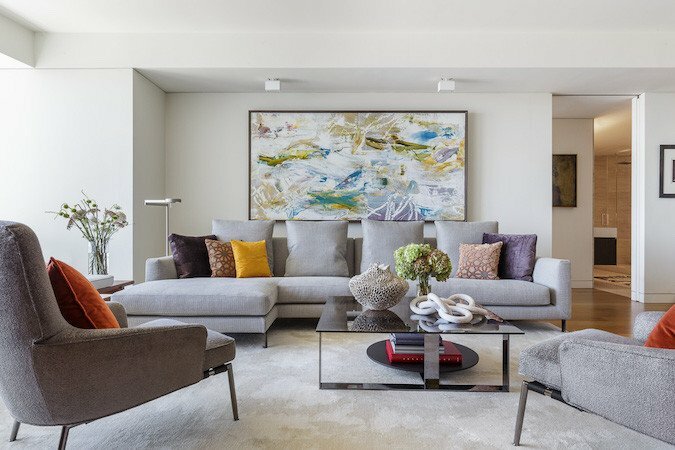 By facing one couch away from the dining area, and another away from the client’s workspace, we established the other three areas of the apartment: a living room, a dining room, and a home office. Once we finalized the layout of the loft, we started adding the finishing touches. 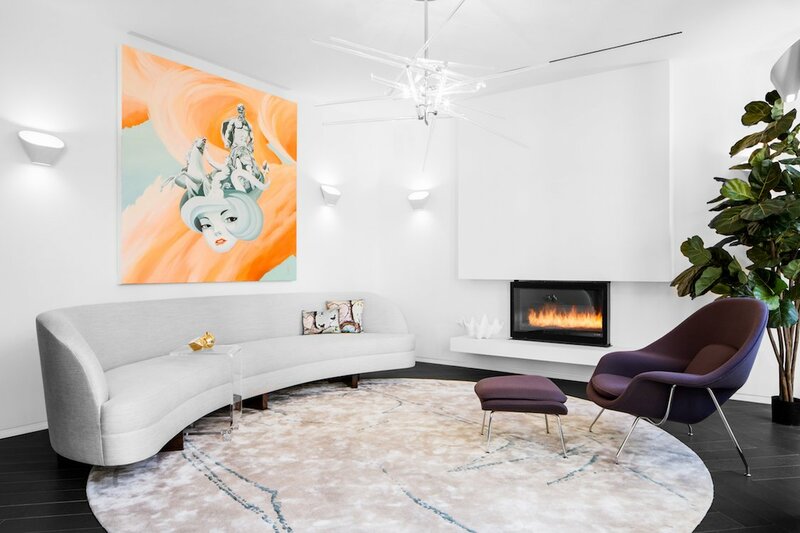 To accentuate the loft’s 12-foot ceilings, we custom-fabricated window treatments, and sourced a nine-foot painting of the Empire State Building. In the living room and bedroom, we added a menagerie of patterned, neutral pillows and throw blankets. The final result is a comfortable, rustic, and sleek loft that this bachelor can now call home.